Plasma – How to remove the cashew | Who Says Penguins Can't Fly? One of the major complaints of Plasma is that you can’t remove the annoying icon from your panels or desktop. Oh yes, I’m talking about the infamous Cashew of Plasma. This is a small guide on how to get rid of the cashews. You probably need version 4.1 of KDE or higher and know a little bit about how to use the terminal. The cashew here let’s you configure the panel by clicking on . If you feel that you’re satisfied with your setup and don’t need the cashew anymore, you can hide it be choosing “Lock Widgets”. This option can be found in many places, such as the right click menu, when you configure the panel or by clicking on the cashew in the upper right corner. Once you’ve locked your widgets, they can’t be moved, resized/rotated or removed anymore. The option to add new widgets will also be gone. If you want to change anything, simply unlock the widgets in the same way as you locked them. 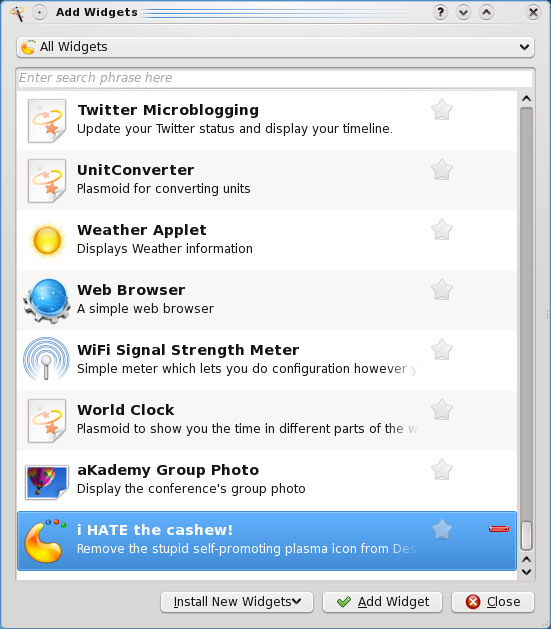 Right click on your desktop -> Add widgets… -> Get new widgets -> Download New Plasma Widgets. Search for “Stealth Cashew” and then click on “Install” next to it. Also make sure that plasma-scriptengine-ruby (or equivalent) is installed; you usually install it using your distribution’s package manager. Original: This one is a little bit tougher. 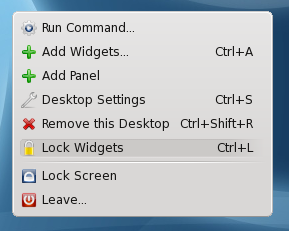 You’ll notice that it won’t go away when you lock the widgets, which has caused frustration among many KDE4 users. One particular person decided to do something about it, and thus the I HATE the Cashew plasmoid was born. Note: The preferable way to install this widget is through your package manager if it’s in the repositories. The steps below describe how to compile it from source. Download the plasmoid here and save it somewhere in your home directory. where filename is the name of the downloaded file, for example 91009-iHateTheCashew.tbz. If you run into errors in this step, it’s most likely a dependency problem. Check that you have all necessary packages installed. When you’ve typed your password and hit Enter, the plasmoid will be installed – you should now be ready for step 6. Below are some corner cases. Sometimes your user has write access to the directory where KDE4 is installed, for example if you have a KDE development environment set up according to this Techbase Tutorial. In that case, you can run make install without using sudo or su. You should find your new plasmoid in the Add Widgets dialog. Add I HATE the cashew to your desktop (remember that you have to unlock the widgets first). And we’re done! Lock your widgets again and all cashews should have disappeared. If you want back on your desktop, simply remove the I HATE the cashew plasmoid by clicking on in the Add Widgets dialog. Nice, isn’t it? Yeah, the more “clean” way to get a desktop without the cashew is to use a containment which has disabled the toolbox. It seems that the default desktop activity in openSUSE 11.1 doesn’t have the desktop cashew. What exactly didn’t work Newar? Do you use KDE SC 4.4 RC or Beta? I haven’t tried yet, but I don’t think this plasmoid works well in 4.4. And even if it did, it’s not as easy to remove using the new widget explorer. If I remember correctly, it wasn’t possible to move the cashew when I published this post. But yeah, now your method works as well. 🙂 There’s also another widget called Stealth Cashew to deal with that yellow thingy. Just passing on that “I hate the cashew” plasmoid doesn’t work with KDE 4.6.2. Neither does the Stealth Cashew mentioned in one of the comments. The hiding behind a panel trick works fine. 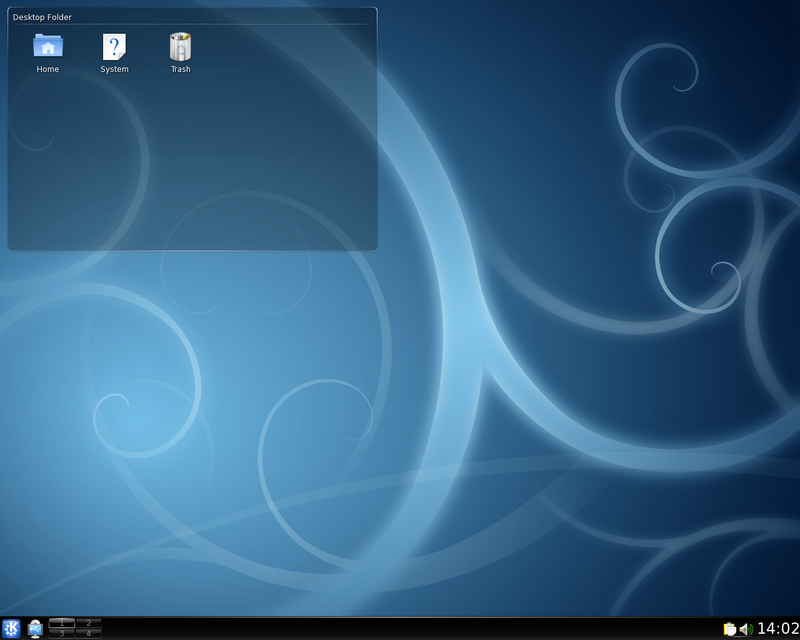 With at least KDE 4.6.2, the cashew is also part of the panel, beats me why. So I had two cashews, or 4 if I am using dual monitors. I really can’t find a use for even one. I’m looking for a way to remove them from the panels now. There’s a patch for iHateTheCashew that make it work with 4.6 (see comments on KDE-look for more details). The panel cashew has pretty much always been there, it disappears when you lock your widgets. Can’t make. Can anybody make a working edition for current KDE with cmake 2.8.x? I get a error message with „cmake -DCMAKE_INSTALL_PREFIX=`kde4-config –prefix` ..
“. File was patched before run cmake. information run “cmake –help-policy CMP0000”. iHateTheCashew hasn’t been updated in a long time and probably won’t work even if you manage to compile it. Instead I recommend that you try the Stealth Plasmoid plasmoid, which I write about in the updated text. It’s trivial to patch kde4-workspace t make the desktop toolbox AutoHide just like the panel toolbox. Plasma devs are just dirty liars that deny user choice. The “ClutteredDesktop” in the playground is just a copy of standard Desktop plus a couple options; one to output some informative text, and the other the option to show the cashew, which when unset will call the DesktopToolBox’s hide function on init. Show when unlocked, hide when locked, like the PanelToolBox, is much more logical than an extra option dialog with an option to always show or never show the DesktopToolBox. Surprise, the solution is basically copy’n’paste from the PanelToolBox to the DesktopTookBox and works as perfect as expected. And what exactly would the developers get by lying about this? From a technical point of view this is easy to implement (which already proves that the developers have thought about the possibility of hiding the cashew), but the developers also have to think about the user experience – what happens if you’ve removed the cashew, as well as disabled the right-click menu, removed all panels, etc.? Could you end up with a broken desktop? I personally don’t agree with the solution of having the desktop toolbox, because I simply think it looks ugly, but that doesn’t mean that the developers are lying. Ironically, you can remove the cashew in Plasma 5, which I get the impression you hate based on your user name. That doesn’t mean that you can’t criticize the KDE, but calling developers “dirty liars that deny user choice” isn’t constructive to anyone. The reason to lie is obvious; remove user choice for greater control. The current developers’ way is the ONLY way henceforth, to hell with the hard work of the previous developers that cared about functionality and user choice. Given your username and the posts you’ve written, it seems like you’re here only to rant about Plasma, so I don’t see any point in continuing this discussion with you.